If you are someone who loves to drink tea, you have to add this book to your collection! 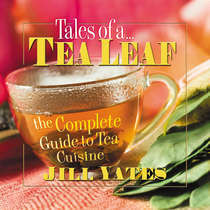 Tales of a Tea Leaf: The Complete Guide to Tea Cuisine by Jill Yates is more than just a cookbook. This “tea bible” contains tea stories, facts, quotes and historical trivia. For example, do you know what role tea played in the impeachment of President Andrew Johnson? Or did you know that there was once a plot to kill Hitler with a cup of tea? In addition to expanding your knowledge about tea, you will find 70 delicious recipes; and they are not just recipes for a cup of tea. How about a loaf of Apricot Tea Bread or a bowl of Tea Thyme Soup? Coconut Tea Cookies with a delightful Raspberry Tea Smoothie sound like the perfect tea-lover’s snack. Does Tea-Smoked Chicken peak your curiosity? This delightful book is the perfect read for the next time you are quietly sipping a cup of tea. And you will have plenty to talk about at your next tea party.